Scale Agility in the Enterprise! 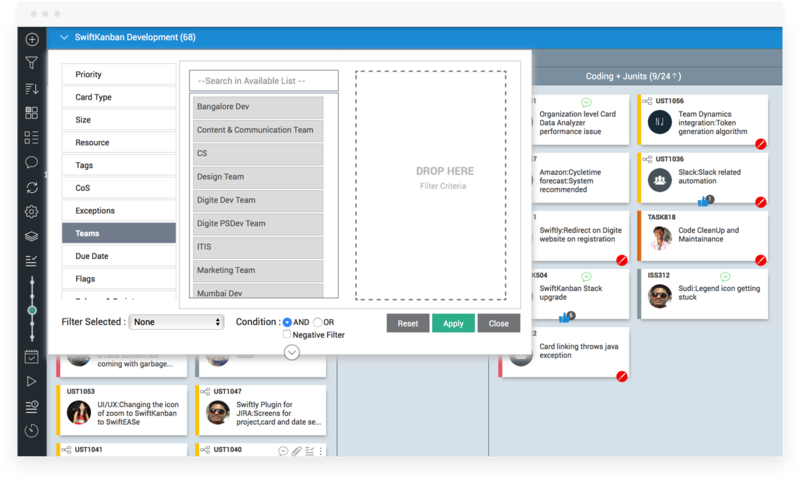 SwiftKanban provides several important features needed by organizations to support Enterprise level Lean Initiatives and Visual Project Management. 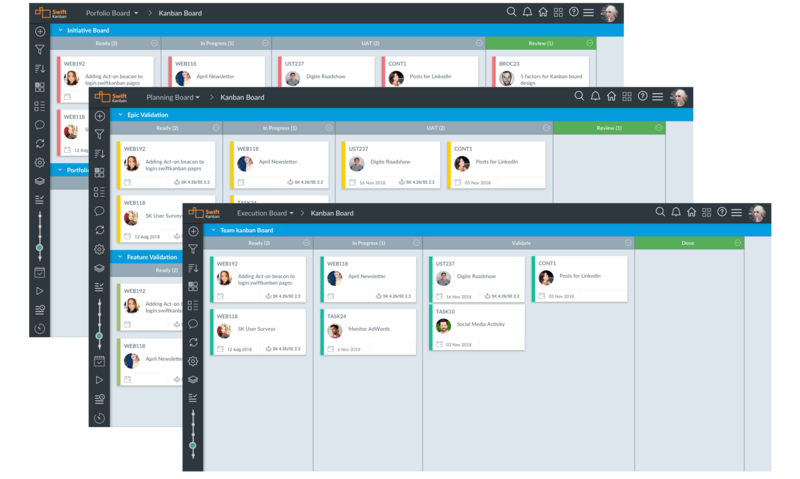 In addition to a robust platform that enables configuration to support a variety of business requirements, SwiftKanban provides strong Portfolio Kanban features, Resource Capacity Management and On-Premise/ Private Cloud availability. SwiftKanban’s Hierarchical Board/ Card design capabilities and other functions provide a great visual method for modeling corporate portfolios of strategic Initiatives, Programs and Projects/ Ops using a set of linked hierarchical boards to manage this task in an intuitive, visual, easy to setup manner. 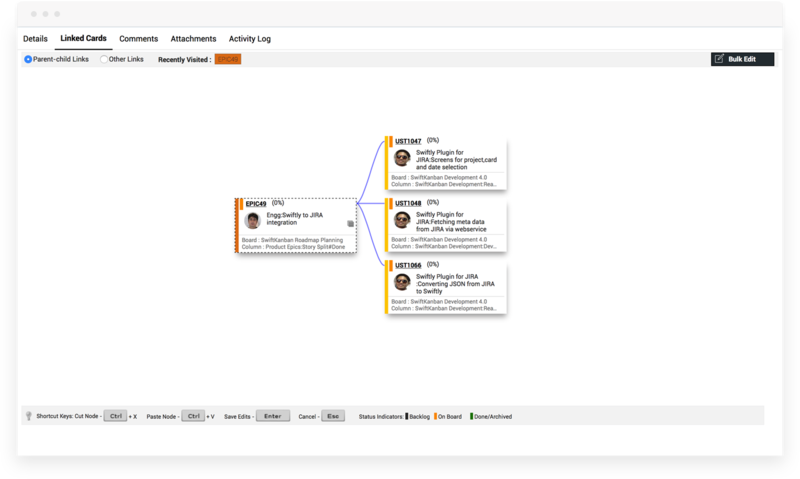 Using SwiftKanban’s Linked Cards feature, you can define Parent-Child hierarchical links or a simpler ‘Other’ link for tracking Traceability for example. You can define these links between cards on the same board or across multiple different boards. You can also choose which card type can be linked to others and by what kind of relationship. You can link to new cards on the fly or you can link to existing cards. You can select multiple cards to link at once too and cards in the Backlog can be linked as well. You can set up and manage flexible multi-board hierarchies for a variety of portfolio, program and multi-team scenarios. A Hierarchy icon appears on the cards that belong to a hierarchy or that are linked to other cards. You can quickly create, modify, or delete multiple parent-child relationship of cards using the Quick Edit feature in SwiftKanban. If you are linking SwiftKanban to external applications, such as JIRA, Microsoft TFS or Rally, you can import hierarchical card data extracts from these apps into SwiftKanban, using the Excel Import capability of SwiftKanban. You can use Excel to create new card, map the relationship hierarchy among new and existing cards and import that file into SwiftKanban. The Card Hierarchy progress bar provides you visual indication of how much progress has been made by a card’s children. You can click on the link to see the drill-down view of child cards and their progress status – both summary and detail level. Once the progress bar is completely green, you know that the parent cards is ready to move to the next stage. SwiftKanban helps you better define available resource capacity and visualize and manage the work done by teams in the organization. You can define WIP limit for every user and apply that limit across all projects for that user using User WIP Limit feature. WIP limit can be set based on number of cards a user can handle at a time, the total number of story points that can be assigned or other custom (numeric) parameters that you might want to use. Once the WIP limit is set, the Kanban system can be configured to either limit further allocation of work to the resource or alert the user to the fact that their WIP limit has been exceeded. This is a very useful feature that can be very useful for users who work with large Kanban boards that involves multiple teams. 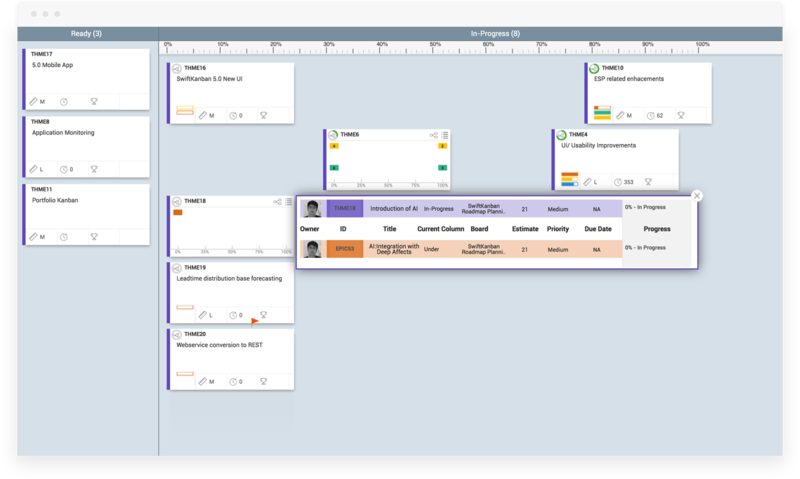 SwiftKanban allows grouping of members into ‘Teams’ and using the Team parameter to filter the Kanban board/reports and track the progress of various cards assigned to a specific team.